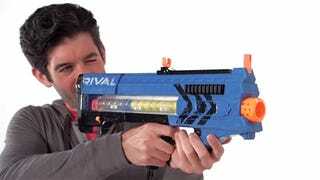 First revealed before Toy Fair 2015 earlier this year, we’re finally starting to get glimpses of Nerf’s new Rival line in action. Designed to keep older kids interested in the toys, the new blasters fire small foam balls at your opponents at speeds of up to 70 MPH, but without the pain and bruises that are common with paint ball. Powered by six C-sized batteries, the $50 Nerf Rival Zeus MXV 1200 uses a 12-shot magazine that can be loaded from either side (for righties or lefties) and emptied as quickly as you can pull the trigger thanks to the blaster’s motorized firing mechanism. Where as the cheaper $25 Nerf Rival Apollo XV-700 features a manual reloading mechanism and smaller seven-shot magazines. But it’s also much lighter to carry, and will never run out of power in the middle of a heated battle.